Every spring, my herbs are among the first plants in my garden to return to life. For more than a month, tarragon and parsley and chives in full flower have been bursting from my raised beds. As luck would have it, these herbs are also complementary, especially when blended into a delightfully pungent, herbaceous spread. 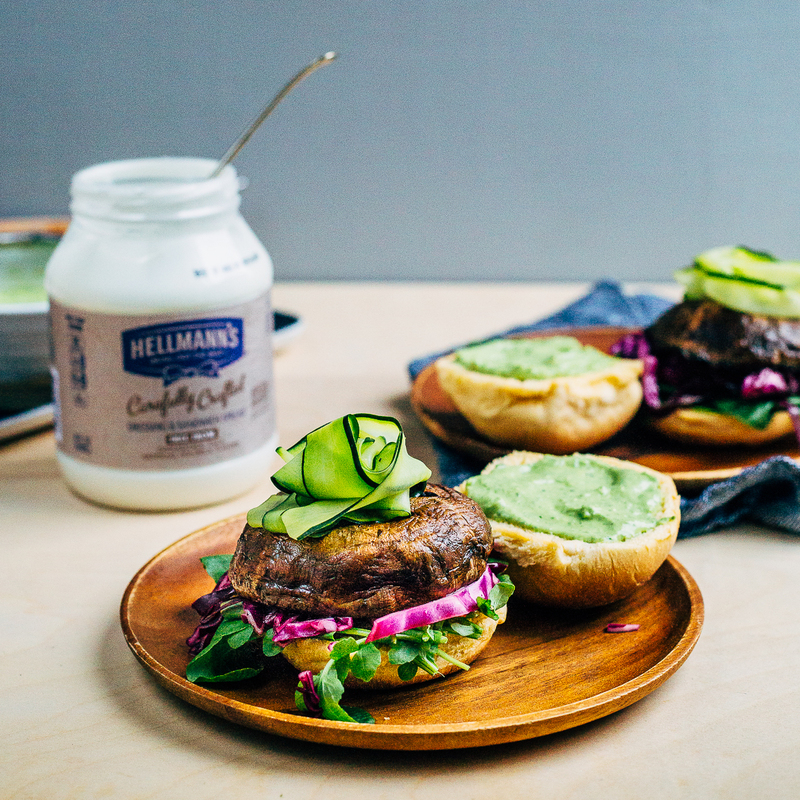 Of-the-moment garden herbs, spicy watercress, fresh lemon, and avocado, along with Hellmann's Carefully Crafted Dressing – a light, lemony dressing and sandwich spread made without eggs – all make for a vibrant green goddess sandwich spread with fantastic flavor. As for the rest of the sandwich, surprisingly meaty portobello burgers cook up simply either in a grill pan or hot skillet. A handful each of lemony zucchini ribbons and shredded red cabbage lend texture and crunch. 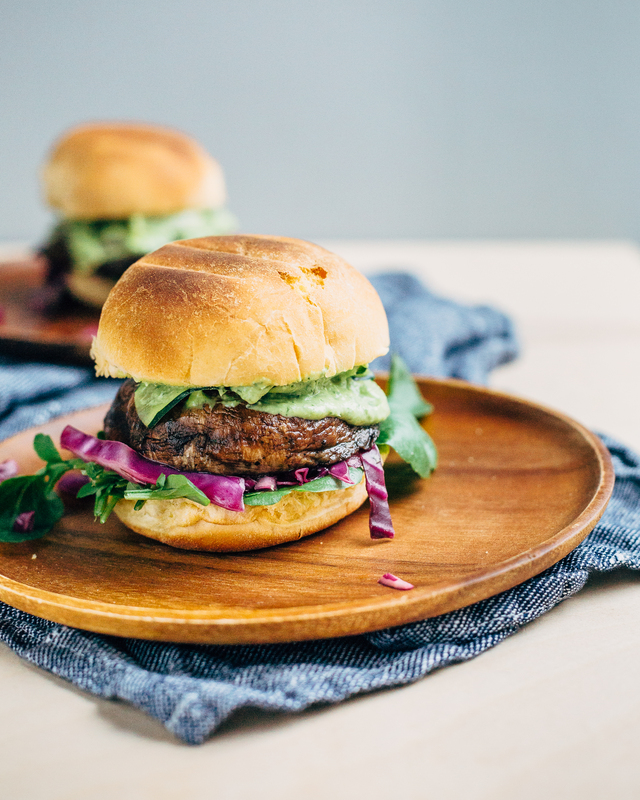 This stacked burger, with its layers of watercress, red cabbage, portobello, zucchini ribbons, and green goddess spread, is a wonderfully satisfying plant-based main. 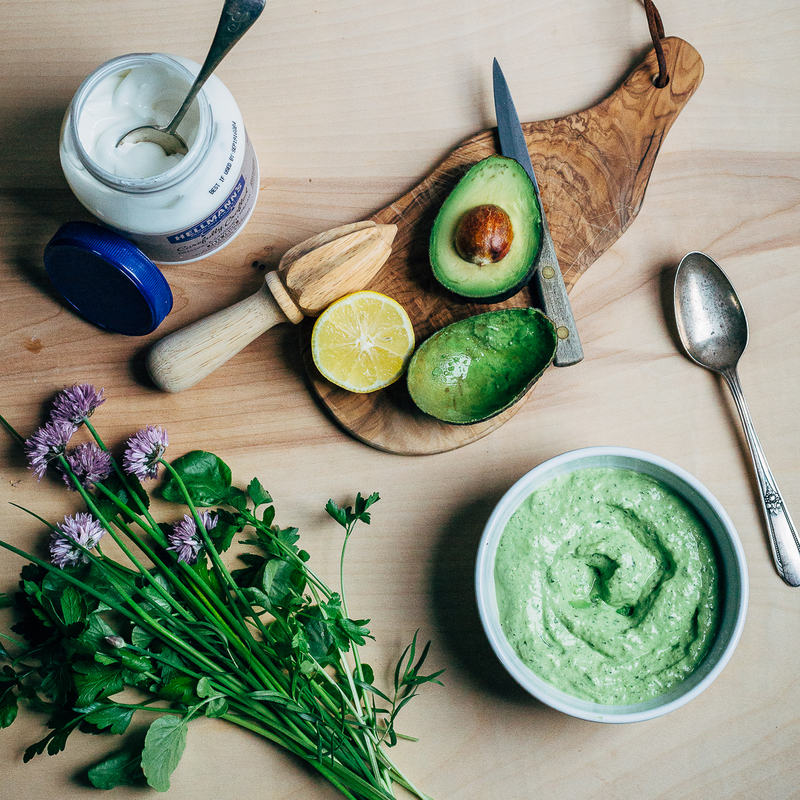 Make green goddess spread ahead of time. 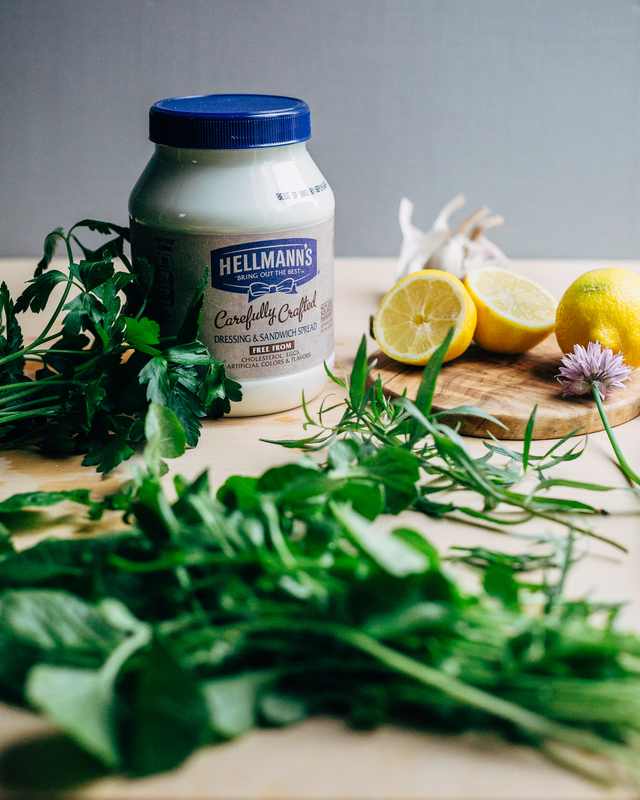 In the bowl of a food processor, pulse to combine Hellmann's Carefully Crafted Dressing, lemon juice, and herbs. When mixture has broken down, turn food processor on and process for 1 minute or until herbs are well incorporated and mixture is smooth. Spoon into a bowl and fold in mashed avocado. Taste and stir in sea salt as needed. Cover bowl; chill at least 30 minutes. To prep vegetables, use a wide y-shaped peeler to create zucchini ribbons. In a medium bowl, toss ribbons with 1 tablespoon lemon juice and a generous pinch sea salt. Set aside. In another medium bowl, toss red cabbage with remaining tablespoon lemon juice, ½ teaspoon olive oil, and a generous pinch sea salt. Toss and squeeze cabbage with your hands, until cabbage releases some of its water. Set aside. Preheat a grill pan or skillet over medium-high heat. Brush portobellos on both sides with olive oil, and sprinkle with sea salt and pepper. Set on grill rounded side down and cook for about 4 minutes. Carefully flip portobellos and cook 4 minutes longer or until portobellos have released their water and darkened along the edges. To serve, layer watercress leaves, red cabbage, portobellos, and zucchini ribbons on bottom bun. Add a dollop of green goddess spread and set the top bun in place. Serve immediately. This recipe was created in partnership with Hellmann’s and FeedFeed – all opinions expressed are my own.